Sharing the limelight. Two or more atoms in an optical cavity can absorb a single photon, according to theory. The cavity allows standing light waves of a single frequency (red glow), which can be limited to one photon. Credit: APS/Joan Tycko/via Physics, 9, 83. Scientists have known for several years that it is possible to have a single atom absorb two photons, causing it to move to a higher energy state. The process has actually been observed many times and is now used in microscopy and spectroscopy—its reverse, extracting the two photons from a single atom, has also been used as a means for producing entangled photons. In this new effort, the researchers wanted to know if the same would hold true for causing a single photon to be absorbed by two different atoms—theory has already suggested it should be possible. To find out, the team created a simulation in which two atoms were held in place by mirrors inside of a chamber—creating a virtual optical cavity. They reasoned that the size of the cavity should be based on the frequency and wavelength of the photon that would be introduced (i.e. it should be double that of the photon). They then introduced the photon and found that in such a circumstance, both atoms were able to absorb the photon—each grabbing half of its energy—and moving into a higher energy state. And because the process could be reversed—the two atoms together producing a single photon, the team believes it might be possible to use the phenomenon in a quantum system—one of the atoms would theoretically serve as a qubit, carrying information. To give up its information, the qubit would move the information to the cavity where the second atom could be used to control transmission. The researchers found that the simulation worked for three atoms and one photon, as well—the energy from the photon was equally divided between the atoms. We consider two separate atoms interacting with a single-mode optical or microwave resonator. When the frequency of the resonator field is twice the atomic transition frequency, we show that there exists a resonant coupling between one photon and two atoms, via intermediate virtual states connected by counterrotating processes. 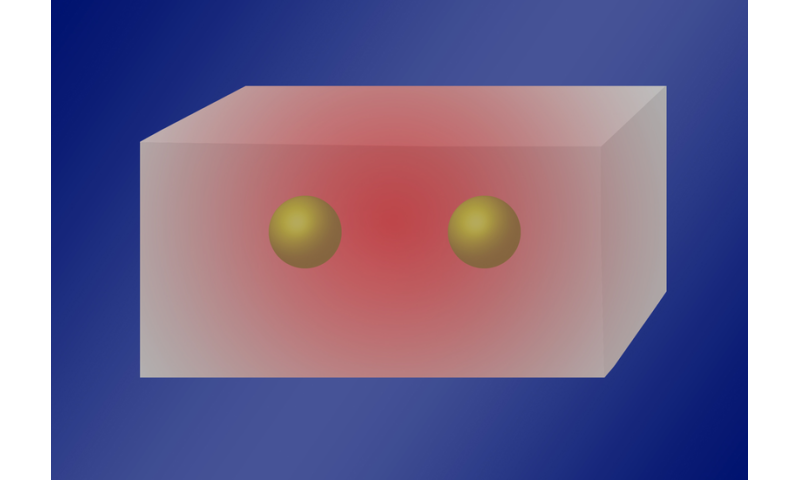 If the resonator is prepared in its one-photon state, the photon can be jointly absorbed by the two atoms in their ground state which will both reach their excited state with a probability close to one. Like ordinary quantum Rabi oscillations, this process is coherent and reversible, so that two atoms in their excited state will undergo a downward transition jointly emitting a single cavity photon. This joint absorption and emission process can also occur with three atoms. The parameters used to investigate this process correspond to experimentally demonstrated values in circuit quantum electrodynamics systems. just as a small guess at the specifics: they're not exciting two atoms with one photon in a completely isolated environment, that'd break the very notion of what a photon is. They're specifically performing the experiment in a resonator. This means the photon is coupling to the complicated Electromagnetic field that exists between the atoms and between the atoms and resonator and with the resonator itself. This complicated EM field then distributes the energy between the two atoms, raising them to excited states. Very interesting, but please don't misread this into saying something more than it does. Photons are still particular packets of electromagnetic energy that only go from one charged particle to a single other charged particle. Photons are still particular packets of electromagnetic energy that only go from one charged particle to a single other charged particle. So, how do single photons interfere with themselves? In low luminescent cases where we specify dependence? Or high energy, to spontaneously generate new masses? If spin is an approximation, what does it matter? Or does beyond N=4, not capture canceling isomorphs? Absence, a lie group's deconditioning. Interference is not the same as interaction. They're entirely separate phenomena. An interaction is where energy and momentum are exchanged from one particle to another (including energy going into the creation of a new particle). Interference is just how you predict which paths are more or less likely for a given particle to travel knowing its position and momentum to some degree of uncertainty at some point in time. Hey, and what is going on with the spin of the photon, which is 1. Does it split into 2 or 3 parts, or more? Spin angular momentum (SAM or "spin") is jointly conserved with orbital angular momentum (OAM, sometimes confounded with spin); this jointly conserved quantity is called total angular momentum, and is the sum of the two others. When the photon interacts with the system of the two atoms and the resonator, and each of the atoms has an electron orbital that undergoes a quantum jump, the spin of the two electrons in the two orbitals in the two atoms undergoes a joint quantum jump in spin to account for the spin of the photon. Since electrons are fermions, it is permitted that they change total angular momentum by half-units of spin. Normally they change by one unit of spin when a single electron interacts with a single photon, but a change of one-half unit is also perrmitted. @daschneib thank you for consideration. Photons with orbital momentum are very special. (special conditions are needed) but they are also nh. But the main point nevertheless is that electron spin changes from -1/2 to 1/2 which needs l=1 and not 1/2. Two electrons need a photon of l=2 but as said this is very special photon. I cant see nothing about l of the photon in their paper. I don't doubt the results of the experiment, but it's a challenge to visualize what is happening and that could lead to misconstruction. You can't stop time to paint a picture of it, because the observation is actually of a dynamic process, the two atoms playing ping-pong with a single "unit" of photonic energy. Gotta keep Heisenberg in mind. @daschneib thank you for consideration. Photons with orbital momentum are very special. (special conditions are needed) but they are also nh. But the main point nevertheless is that electron spin changes from -1/2 to 1/2 which needs l=1 and not 1/2. Two electrons need a photon of l=2 but as said this is very special photon. I cant see nothing about l of the photon in their paper. Note also that the Hamiltonian consists of counter-rotating states; this indicates that the photon is not in the ground spin state, s=+/-1. They figured that anyone reading the paper would realize this.